January brings fresh beginnings and with it, many new resolutions. There are the typical “lose ten pounds,” “make time for family” and other very worthwhile goals. But many of us choose to try new things, or master a hobby or skill. The English Tea Store brings you teas of the month, which is a featured selection offered at a discount. In January it is Buckingham Palace and China Jasmine Green teas. In the spirit of learning and trying new things, we will be exploring the monthly teas in depth here. Today we will look at the Buckingham Palace. The Buckingham Palace Garden Party tea loose leaf blend is a delicate medium tea with a hint of Earl Grey and Jasmine. This is a lighter afternoon tea. At least three times each summer, the Queen holds a garden party at Buckingham Palace, as well as one in Edinburgh. Queen Victoria began this tradition in 1860 with what was called “breakfast” but was actually served mid-day. Back then, she hosted two of these events a year; in the fifties the third was added. Originally a prestigious debutante rite of passage, they now include honorees recognized for service. From 4-6PM, the over-30,000 guests are invited to stroll the grounds while royalty mingles through a series of laned walking paths. Each royal family member takes a different path so guests never know whom they will run into. The beginning and end of the event is marked by the National Anthem. According to the British Monarchy website, even though the event lasts only two hours, a staggering number of sandwiches, slices of cake, and cups of tea are served by over 400 waitstaff. Over 27,000 cups of tea are served from long buffet tables. The tea that is served is a delicious Palace medley of five teas: Ceylon Early Grey, Jasmine, Assam, Dimbula Ceylon, and Ceylon East of Rift. The intriguing hints of high-grown pure Ceylon Earl Grey blend effortlessly with the soft jasmine from Fujian Province. Couple this with malty Assam (from the estate of Borengajuli), flavory Dimbula Ceylon (from Hatton), and golden cup East of Rift Kenya (from Kambaa and Kagwe); and you have one of the most flavorful teas to come from the British Isles. The flavours present themselves at separate times in the drinking of the tea so no two cups are ever the same. 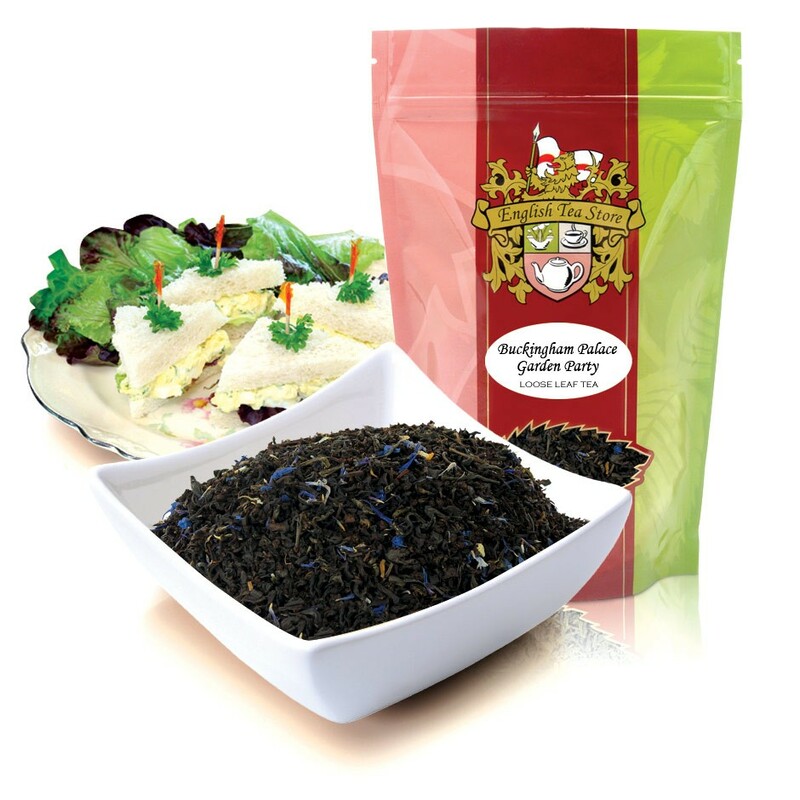 Buckingham Palace Garden Party tea is available from ETS in either bag or loose leaf.